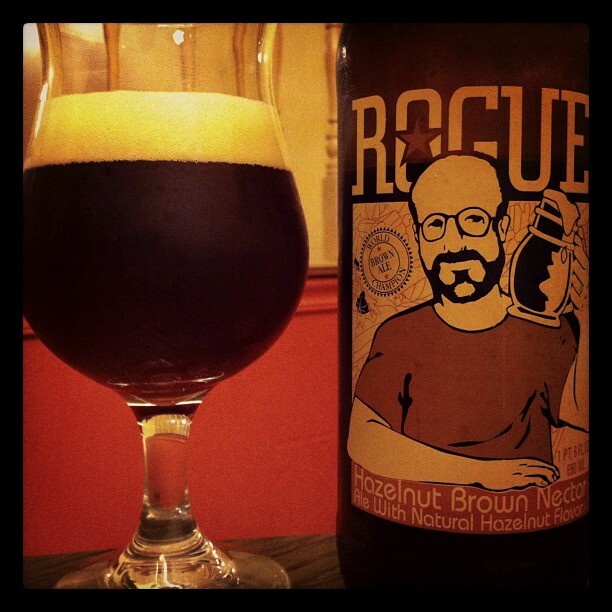 Rogue Ales (Newport, Oregon) recently won a Great American Beer Festival medal for the beer up for review today, Hazelnut Brown Nectar. Rogue was founded by Jack Joyce, Bob Woodell, and Rob Strasser in 1988. They’ve been brewing for quite a while, and my bottle shop shelves show it; they are always stocked with many different selections from Rogue. Rogue’s head brewer is John Maier, and he is famous for producing the Pacman yeast strain, which are used in nearly all of Rogue’s offerings. One thing I don’t like is that Rogue does not openly put ABV (alcohol by volume) on the bottle — instead, they give you a math formula to figure out the alcohol content by using Plato (which is printed on the bottle) divided by 2.5. While that’s nice to know, it seems my calculator may have some internal problems, because each Rogue beer I’ve had doesn’t compute with what other websites say. 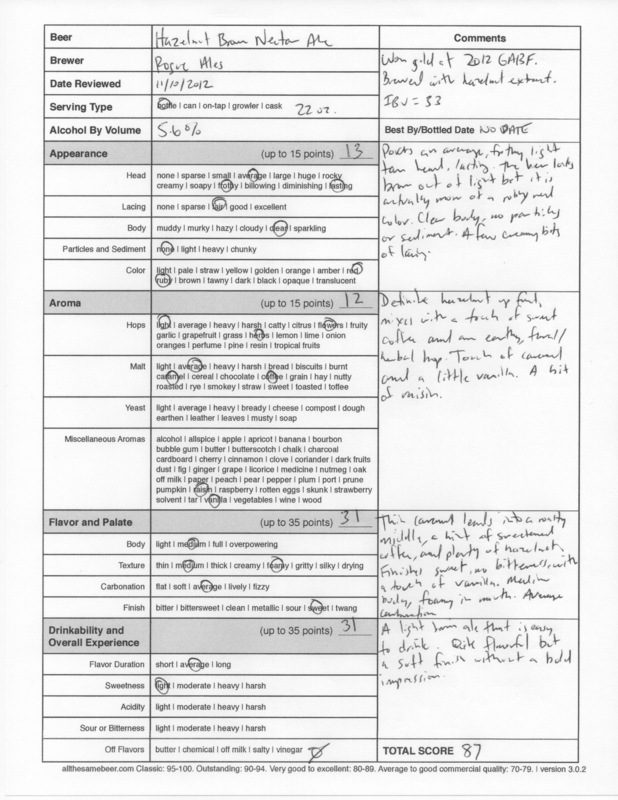 Example: For this beer, the Plato is 14; so divided by 2.5, that gives us 5.6% ABV. But nearly every other review site on the web, including the big ones (Rate Beer/Beer Advocate) say 6%. What gives? Rogue, just print the damn ABV on the bottle! Hazelnut Brown Nectar is a year-round brew, made with seven different malts (Great Western 2-Row, Brown, Carastan 13/17, Crystal 70/80, Crystal 135/165, Beeston Pale, and Chocolate) and only two hops (Perle and Sterling). Hazelnut flavoring is added to the drink, and it registers 33 IBUs (International Bitterness Units). 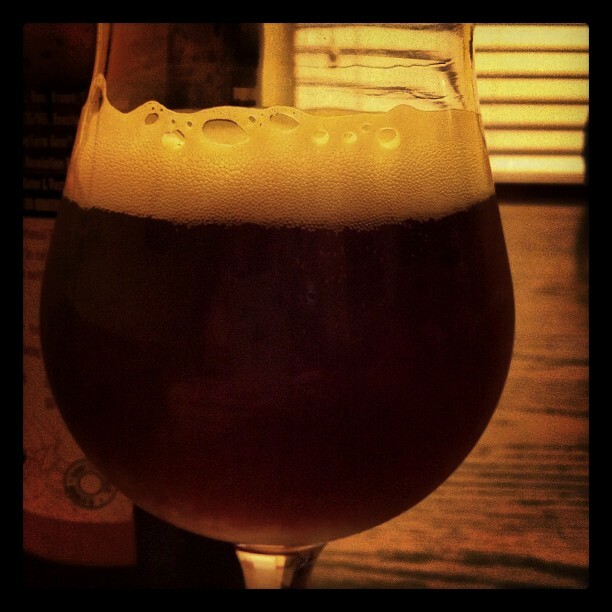 This Brown Ale poured an average size head, frothy in texture, light tan in color, and lasting. The beer, while it looked light brown with shades of orange out of the light, was actually a deep ruby red color when held to the light. The body was clear and free of particles and sediment, and lacing was fair, leaving behind patchy thin sheets of creamy foam. On the nose, there’s definite hazelnut, supported by sweet coffee and an earthy, floral/herbal hop. There were also hints of caramel and a nice vanilla, with a dark edge of raisin. The Pacman yeast Rogue likes to use is here in full force, contributing a dark candied orange flavor that combines with a base layer of caramel. It’s somewhat subdued at first, and the middle of the taste opens up with hazelnut and sweetened coffee. The finish, which was sweet but not overly so, comes on with hazelnut, caramel, a thin note of coffee and a pleasant vanilla. This brew was medium bodied with a medium mouthfeel, foamy when swirled by the tongue and possessing average carbonation. For a Brown Ale, I thought Hazelnut Brown Nectar was a touch thin, but it is quite easy to drink and has good flavors. While it does have only a few definite flavors you can put your finger on, the complexity amps up when combined with the Pacman yeast. That being said, no one flavor here leaves a bold impression, and I was kind of expecting the Hazelnut to take that role, considering it is in the name of the beer. 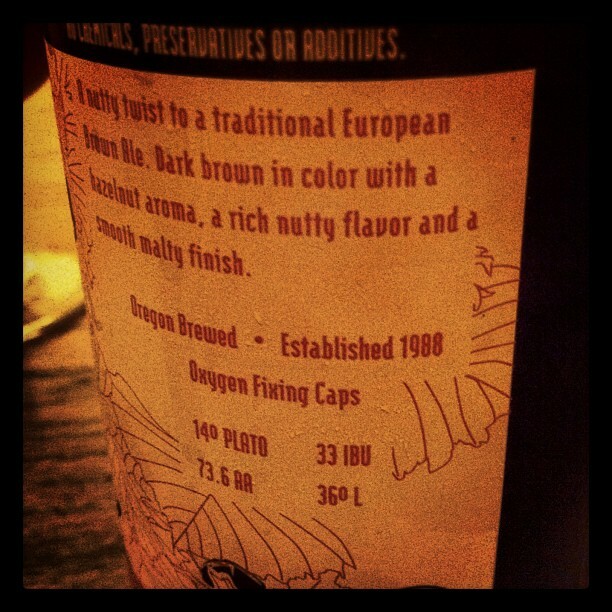 Rogue Ales Hazelnut Brown Nectar Ale, 87 points. Price: $6.99 US for one 22 oz. bomber size bottle.